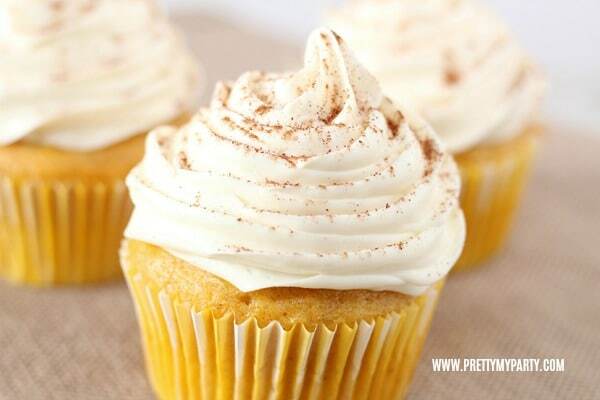 These Easy Pumpkin Spice Cupcakes are so simple you’ll be able to finish them up in no time. They are the perfect school snack, or a great addition to any fall gathering, inside or out! When it comes to baking, easier is always better, right? That’s why these Easy Pumpkin Spice Cupcakes will be right up your alley when asked to bring something to the fall gathering at school, with friends, or in your neighborhood! They are so easy to whip up, you’ll be ready in no time! 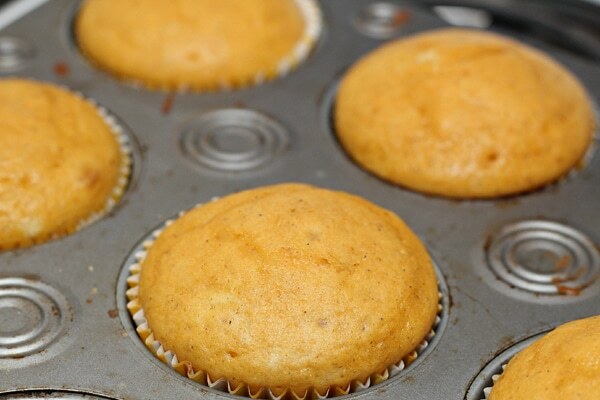 Whenever pumpkin spice cupcakes using cake mix can be accomplished, it is my kind of recipe! And it’s an easy recipe to make with the kiddos, as well! Many of us have different fall events that pop up on our calendar this time of the year, but sometimes it can be a little overwhelming to figure out what to make on short notice! Especially when you want to bring a great pumpkin-themed dessert that won’t require too much time and energy to prep. That’s where this Pumpkin Spice Cupcake Recipe comes in! None of the ingredients are overly complicated and can be purchased quick and easy at your local grocery store. Because you’re using a cake mix as one of the ingredients, it makes the entire recipe even easier! It’s a win-win. Don’t get us wrong, some may want to make a recipe like this from scratch with all fresh ingredients and may gasp when hearing it comes from a cake mix, but we’re totally fine with this compromise! We’re busy and we have lots of things to do with not a lot of time to do it! Even better, this is an easy recipe to double, or even triple, to make as many cupcakes as your event needs. Don’t be overwhelmed, because with the ingredients list being easy and affordable, you can quickly make this Pumpkin Cupcake Recipe serve as many as you need! Start by mixing up the yellow cake mix, eggs, water, and oil. Mix until smooth. If you have an electric mixer, this always helps things go a little easier, but no worries if you mix by hand. It will be fantastic no matter what! Once you have mixed the first ingredients, continue to add in the pumpkin pie filling, all spice, nutmeg, and pumpkin pie spice. Yum! 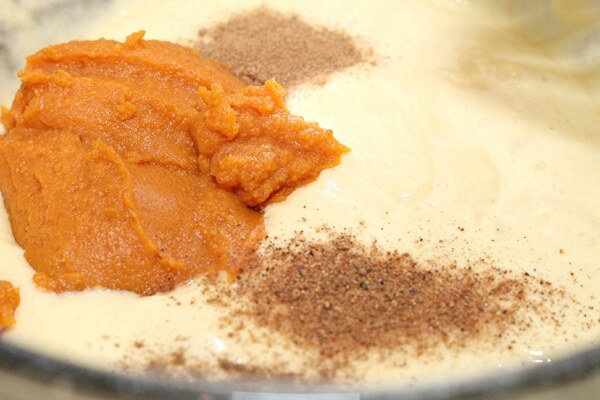 Now it’s definitely feeling like fall with some delicious Pumpkin Spice Cupcakes ingredients! Mix with a hand mixer on high until smooth. As discussed in Step 1, if you don’t have an electric mixer, you will still get delicious Pumpkin Spice Cupcakes that are going to be easy and the best fall treat on the block! 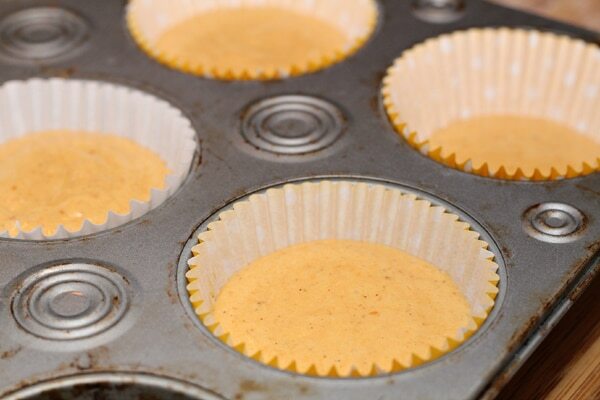 Once the mix is smooth and all ingredients have been added, spoon the batter into cupcake liners. Typically, it is best to fill the liners 3/4 of the way to the top. This allows the cupcakes to expand as they cook and they should end up right at the top of the liner after they have been in the oven! Put the cupcake pan in the oven and bake on 350 degrees for about 13 minutes. Continue to check the cupcakes, or use a toothpick to test the cupcake. Make sure the toothpick comes out clean to make sure the cupcakes are cooked through before removing from the oven. I always use this as my quick test before taking out cupcakes or cakes from the oven! Let the cupcakes cool completely before frosting them. This is an important step, because otherwise the frosting will melt off of the cupcake and will make quite a little mess. I know how hard it can be to be patient while they cool down, but believe me, it’s worth it! Now comes the fun part! 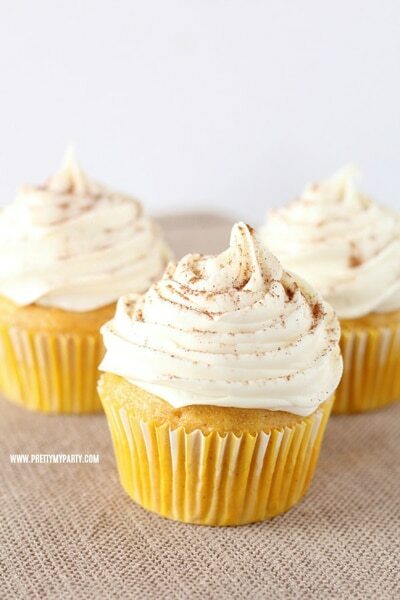 Top all of the cupcakes with vanilla icing, and sprinkle with cinnamon. You can be as fancy as you want to be with this part. In a hurry and aren’t as worried about presentation? Than by all means, use a knife and frost the cupcakes easily with no fuss. Feeling a bit more fancy? Grab your favorite frosting tip and fill a pastry bag with the frosting. Have fun decorating and making the cupcakes look a like a pro did them! Quick Tip: Point the tip of the pastry bag on an outer edge and apply even pressure to the frosting-filled part of the bag with one hand while using the other hand to keep the top of the pastry bag tightly twisted. Move in a circle around the outer edges and work your way to the center of the cupcake, releasing pressure gently when you reach the center to leave a nice frosting peak. Because lets face it. The frosting is the best part of a cupcake, hands down! And while some may not enjoy the frosting portion of cupcakes, I absolutely love it! And… you’re done! Once you’re completed with the frosting for the Pumpkin Spice Cupcakes, feel free to serve and enjoy! If you’re not serving them immediately, make sure you store them somewhere where they will remain moist and ready for whatever event they may have been made for! 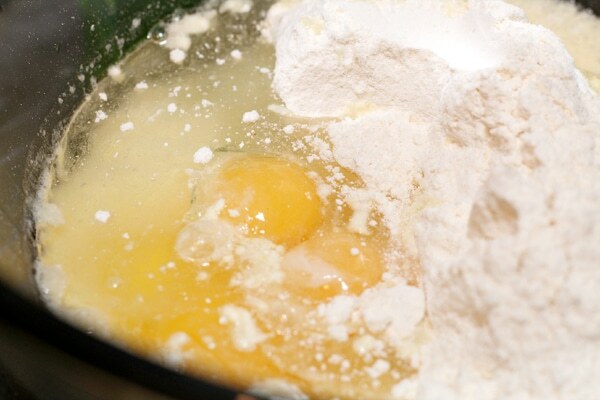 Start by mixing your yellow cake mix, eggs, water, and oil. Mix until smooth. 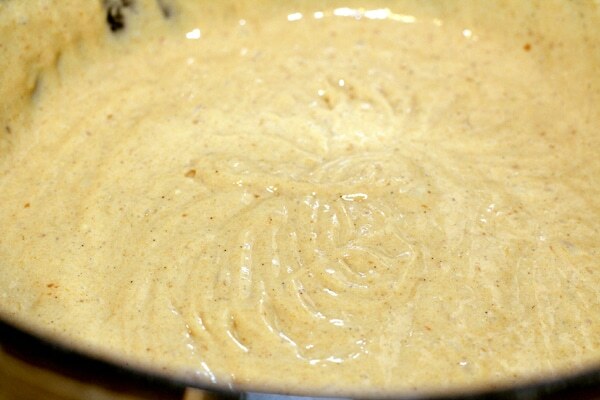 Add in pumpkin pie filling, all spice, nutmeg, and pumpkin pie spice. Mix with a hand mixer on high until smooth. Spoon batter into cupcake liners, and fill 3/4 of the way. Bake on 350 degrees for about 13 minutes. Top with vanilla icing, and sprinkle with cinnamon. Serve and enjoy! And just like that, you have the easiest pumpkin cupcakes that can be taken anywhere you need to be this fall! Don’t fret over the short notice, because you’ll get these out of the door in no time. And with simple ingredients and easy instructions, this is a big mom-approved fall treat! I can feel the fall air rolling in, as we speak, and these cupcakes are sounding better and better by the minute. We might be making them sooner rather than later in our home. I may have some helping hands to add to the fun, but that makes it even more enjoyable! It’s a great recipe to make with the little ones! Enjoy! This was really awesome. I tried the recipe last week and it was the best cupcake I have ever made. Thanks for sharing the recipe along with every important detail! That’s great to hear! I’m glad you liked them!